Lin Onus, Gumiring Garkman, the Serigraph, Courtesy Coo-ee Aboriginal Art, 1994. Despite his premature death at just 48 years of age, Lin Burralung Onus played a pivotal role in the emergence and recognition of urban Aboriginal art. He began his artistic life assisting his father Bill in decorating artifacts and went on to develop skills working with metal and painting with airbrush as a panel beater. Onus’ family was a focal point for social life amongst Aboriginal people in Melbourne and played host to Albert Namatjira amongst many other visiting artists during Lin’s youth. He was no doubt influenced by Namatjira when he began painting photorealist landscapes and watercolours at an early age. His first major commission was a set of paintings on the first Aboriginal guerilla fighter Mosquito completed when in his early 20’s, which still holds pride of place on the walls of the Advancement League, in Melbourne, to this day. Although represented by Gabrielle Pizzi in Melbourne and Painter’s Gallery in Sydney his career as an artist languished until 1986 when, during his visit to Maningrida in Arhnem Land, he was accepted as a son to renowned cultural custodians Jack Wunuwun and John Bullun Bulun. Having given him permission to depict several of their stories and use their clan designs in his work Onus was finally able to develop the distinctive visual language that characterized much of his future work. Onus, a great communicator, was acutely aware of the desire amongst non-Aboriginal viewers to understand the meaning of the concept of ‘the Dreaming’. In works such as 24 Hours by the Billabong, Evening Reflections and in his many depictions of the Bahmah Forrest, the flooded Eucalypts near his Yorta Yorta homeland at Cumeraganja, are often depicted with cross hatched-fish beneath the water’s surface or a jigsaw puzzle piece missing from the panoramic landscape. His installation Fruit Bats was exhibited in the Australian Perspecta 1991, consisting of a Hills Hoist carrying a multitude of fiberglass bats painted with rarrk, a ceremonial Arhnem Land crosshatch design. Onus, was imparting his knowledge that, beyond the immediately apparent there is another dimension, a Dreaming reality that anyone can become aware of if only they open their eyes and their minds to its presence. Lin Onus’s manual skills and experimental zeal coupled with an intense desire to embrace different cultures manifested itself in his avid adoption of new materials and technology, such as fibre-glass, plastics, silicon, a variety of print mediums, and humorous time saving devices such as rarrk making stamps and dotting machines. He was driven in his efforts to take Aboriginal art into the new century. Onus wanted to challenge the myth that in embracing new technologies Indigenous peoples would loose their culture pointing out, as just one example, that the four wheel drive has allowed more ceremonial activity to be conducted than ever before. Following his exposure to screen-printing and wood block prints during a cultural exchange in Japan he began creating a large body of works on illustration board and number of limited edition prints. Serigraphs and linocuts were produced while working with Israeli born Shaike Snir and Melbourne artist Jeff Makin at Port Jackson Press. The work illustrated is one such work. 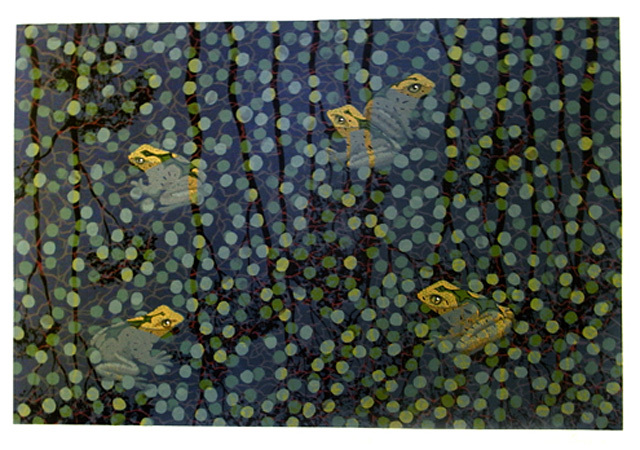 Gumiring Garkman 1994, depicts frogs sitting amongst lily pads in a realist billabong. The layered surface of the waterhole was achieved using multiple screens and overlays. It is technically referred to as a serigraph rather than simply as a screen-print, in order to indicate that the artist was intimately involved in the process of developing the screens rather than leaving it to a master printmaker to produce the colour separations from an original work of art. The highest price achieved for one of the prints in this edition at auction was $4543 at Leonard Joel in their April 2006 Melbourne sale (Lot 671). An artist proof such as the one illustrated sold for $3840 at Lawson~Menzies in 2007 (Lot 473). His paintings on board have sold for as much as the $27,000 paid for Butterflies 1994 at Deutscher~Menzies in December 2006 (Lot 14), while $16,800 was paid for a set of Giclee graphics depicting the The Ongoing Adventures of X and Ray 1994-1995 at Lawson~Menzies in November 2007 (Lot 128). His auction record for a limited edition print was the $10,472 paid for Goonya Na Bilda 1994 at Joel Fine Art in October 2006 (Lot 139). Amongst his prints offered at auction, 36 of the 53 presented have sold for an average of $3,509 while the average price achieved for the 9 of 10 works on paper that have sold is $17,401. During his final years he was the most visible of all Aboriginal artists in his many roles which included being Chairman of the Aboriginal Arts Board of the Australia Council, a founding member of the artist’s copyright agency Viscopy and an eloquent speaker enlisted by peak arts bodies to act as a spokesman at the National Press Club and other prestigious gatherings. Above all, Lin Onus was an artist who made ‘no distinction between the political and the beautiful’. His contribution changed forever the perceptions about the nature of Aboriginal Art, and put urban Aboriginal art onto the Australian cultural map.